The new Silver Queen was developed as a moderate approach to the Natural Balance Shoe and the World Racing Plate. It has a beveled toe that allows ease of break over to help reduce the strain on muscles, tendons and joints. The Silver Queen has a thicker cross section that creates a better cupping action. More nail holes so that the farrier can choose and alternate the nail pattern from one shoeing to the next to help preserve the integrity of the hoof. The heels are tapered on the inside to reduce the pressure on one of the most sensitive areas. 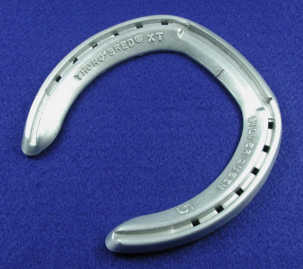 The Silver Queen is basically a front shoe although it can be used on the hind for horses that forge. If a horse requires icing or therapy after exercise it should raise a red flag to consider break over.